I think I eat too much meat. I’ve been trying to cut down recently, have a couple of days a week without any meat, and to eat more fish and seafood instead of just, well, red meat, that sort of thing. My efforts have been moderately successful so far, but I’m hitting a definite limit in my repertoire of vegetarian meals. I’m becoming a little tired of this roasted butternut squash and chickpea stew, good as it is. The truth is, I’m not terribly good at vegetarian food. I like to eat vegetarian food, of course, but I’m not very good at making substantial vegetarian meals. It isn’t through want of trying, and I’ve picked up some excellent ideas and dishes from some superb cookbooks recently, but there’s always space for more inspiration, no? And what is the point of the humble cookbook if not to inspire? Some are better than others. Some work, some don’t. Sarah Britton is the writer and nutritionist behind the superb blog, My New Roots, and author of the successful cook book of the same name. She specialises in vegetarian food, and may prove to be my saviour. 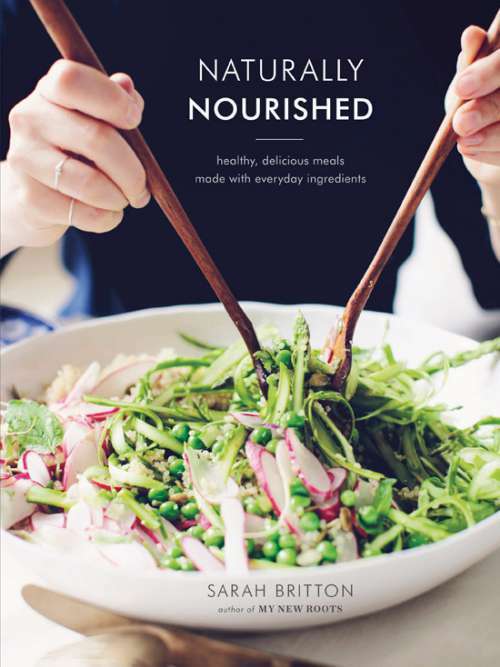 Britton’s latest book, Naturally Nourished, is a rich collection of vegetarian food from soups and salads, though larger main courses, into side dishes and small plates, finishing up with some savoury and sweet snacks. Most of these recipes are designed to be put together quickly and easily, and Britton pushes the concept of ‘rolling over’ recipes from day to day to make life easier. Day one – make a quinoa salad, but cook double, so that there’s enough left the second day to make something out of lentils and quinoa, but cook double lentils for the day after, etc, etc. Why anybody would want to cook any quinoa at all is beyond me, but you get the idea? There are plenty of recipes here that could be adapted to that sort of approach, and there’s a lot of time to be saved by doing so. I like the idea of some soured cream and onion chickpea crisps … essentially posh roasted chickpeas, which have been a recent success with the kids in our house, especially when accidentally loaded with a little too much salt. There’s a stuffed pumpkin recipe, labelled as ‘ceremonial’ that might have crept out of the pages of the Seventies cookbooks my mum and dad used to have, were it not for the decidedly on-trend filling of bulgur wheat, feta and figs. There’s a mildly perplexing watermelon mojito ice lolly recipe, which looks stunning, mint leaves encases in watermelon red ice, but which on closer inspection omits a vital ingredient in anything purporting to be a mojito: rum. All in all, a useful and interesting cookbook, well presented, superbly written and a treat to look at.